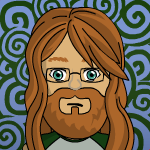 Not perfect but hopefully I'll have the back finished shortly then a a little bit of tidy up in GIMP and I'm done. First one finished up, I'm going to try and do one rampant as well then I'll place both on a page and generate a GSD file. Wow, it´s great Sirrop, i like the wing´s texture. 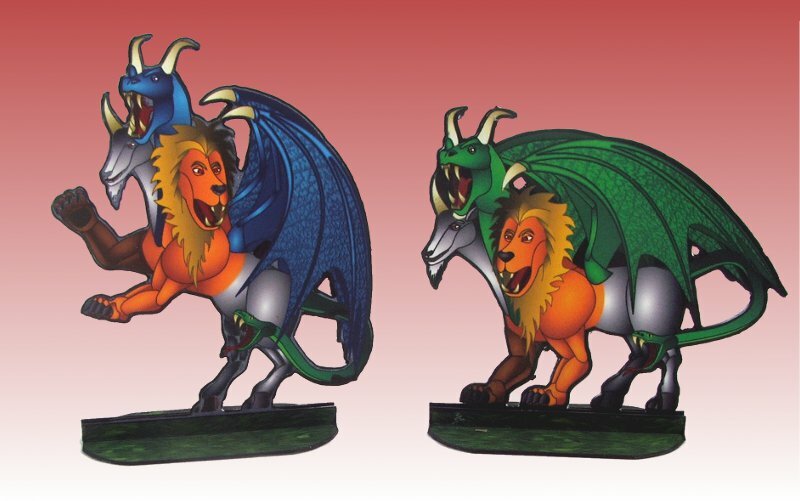 Will you make different chimeras? supercool. 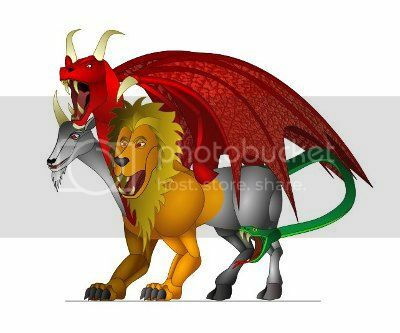 your chimera is great. I think I will assemble one tomorrow. Thanks alot. BTW: do you know what is with onemonk? He seems not to write anymore here. Thanks both for the comments . 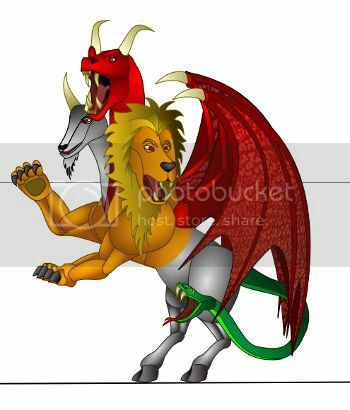 Yes I'm going to do 3 colours of each pose red/blue/green (just re-colours no new elements), basically 3 fit on a page so it makes two full pages of chimera's, less wasted paper . Onemonks off getting fit and healthy so he can supply us all with paper mini's for another 45 years . I suspect he's droping past every now and then but trying to stay focused on his health and hence not posting much/at all. Hope to have the two pages of Chimera's test built and uploaded with GSD files in a few hours. All done, I ended up pushing the bright/contrast up a fair bit on the final print versions (after id printed the test versions below). Hopefully they wont be to bright now for other people when they print, If someone does print them and they are to bright let me know, The second batch I printed seemed much nicer . these chimis are great. I am looking forward to assembling them. Thank you very much for putting them up. Thanks enpeze hope you have fun with it. Very cool, Sirrob. I like them both. Glad to see you changed the dragon color. Adds just a touch of variety to the figures besides the stance. Big monsters are always in demand. Thanks all . I feel like I ripped off the Chimera species a little as no white or black dragon versions. BTW, switching the .odt files to .gsd files worked just dandy on my end. 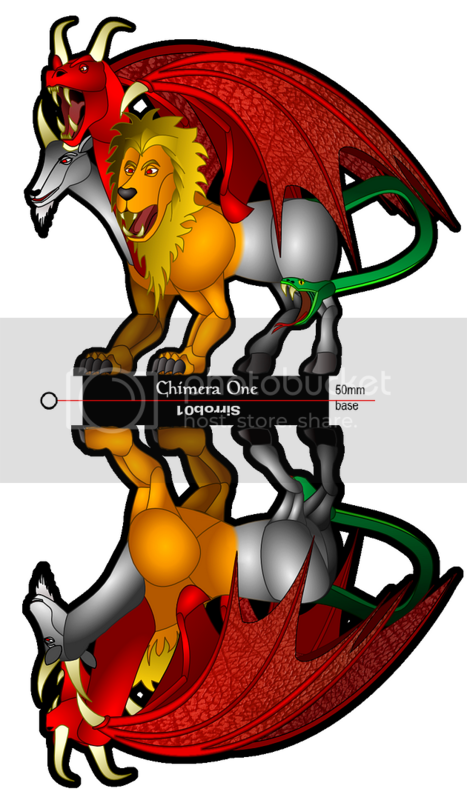 I now have a half dozen chimeras stalking my workspace. squirmydad thanks for the confirmation, I tested it myself but I'm never sure until someone else succeeds.